There’s been a lot of behind-the-scenes drama when it came to the making of Logan, Hugh Jackman’s (alleged) swan song as the character also known as Wolverine. And of course there’s alleged drama between Marvel Comics, the owner of the character, and 20th Century Fox, the current holders of the movie rights. But they just came together for something very cool — the problem is going to be for fans to get their hands on these neat mini-posters. 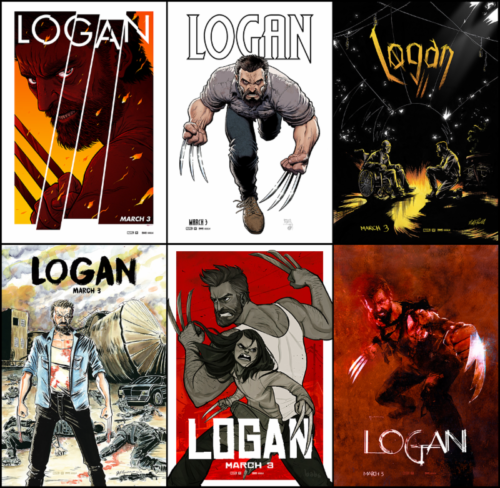 Six award-winning comic book artists have created custom, limited-edition LOGAN homage posters. These exclusive posters will only be installed in six locations found along the route Logan takes in the film. If fans can’t make it to one of these locations, they can get one FREE mini-poster with each ticket purchase at http://fox.co/LoganTix! Also, I heard from David J. Fowlie last night — and he says the movie is incredible.